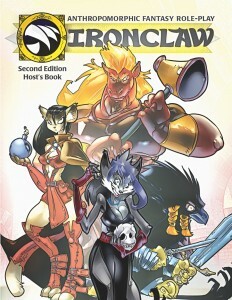 Experience Ironclaw’s rich and detailed world of Calabria, where dozens of species live together in sprawling cities and war-torn countryside. Kings broker for power with clergy, wizards, and merchants, each one struggling to conquer all they survey. Meanwhile, beneath the notice of the squabbling powers, lurk greedy robbers, cruel slavers, and dark necromancers who prey on the weak, the helpless, and the forgotten. 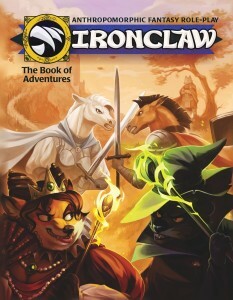 It is a time for mighty warriors, for quick rogues, for clever wizards – a time for heroes! 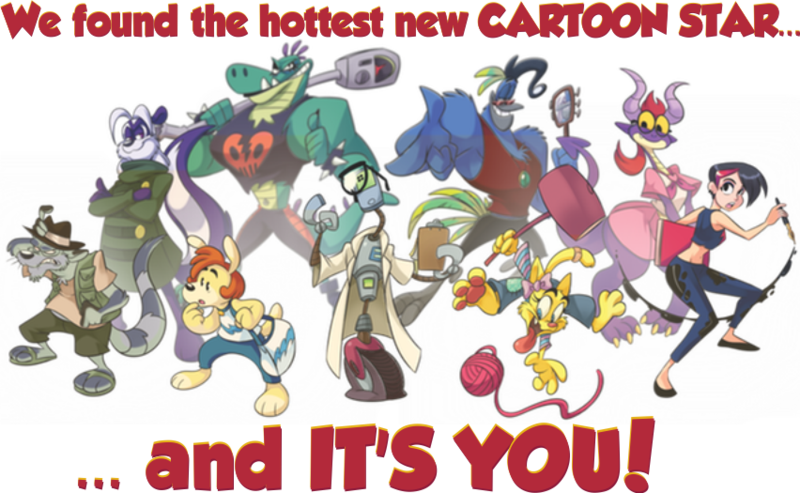 MADCAP is the role-playing game where you and your friends become wacky characters in a cartoon show that you create! Choose a playbook, such as the know-it-all Smartypants, the devious Trickster, the meta-satirical Self-Aware, and the proverbial more! Use gimmicks to customize your character for any role, such as the beleaguered small-town sheriff, the hapless red-shirted space explorer, the incompetent wizard. Build on your each other’s jokes, stack up the laughs, and (maybe) take a few lumps when your hare-brained schemes blow up in your face. With full-color illustrations by animation professionals, MADCAP is the game that brings out the wacky side of your imagination. The laws of physics do not lie, cheat, steal, hold grudges, right wrongs, or fall in love… you do. Powered by the apocalypse, drawn by narcoleptic dreams, and precisely queued to your needs and desires, Farflung is the role-playing game of end-game science fiction after-dark. 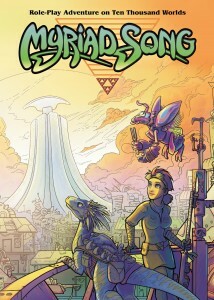 Whether your fantasy is to be a gestalt hive-mind, an energy being of cosmic power, a lord of time and space, or even just an ordinary person, the Farflung game combines simple rules with high concepts so that you can play the character you want. A unique points-in-time system has each of you taking turns in the spotlight to tell your side of a story that has infinite diversity in infinite combinations. In the darkness of ages past, our universe was visited by aliens strange and unknowable. They enslaved hundreds of people and they conquered thousands of worlds. For untold generations, the Myriad people served them, and worlds were stripped of all resources, and left barren and dead. And then, a century ago, the Syndics were gone. 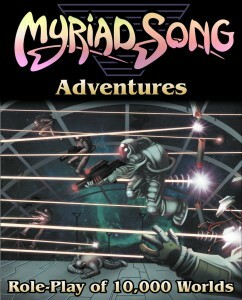 A complete game in one volume, MYRIAD SONG is a science-fiction adventure where you will travel in the strange legacy of an alien empire. Discover primitive worlds with savage monsters . . . high-tech stations of amazing technology . . . derelict planets where people scrounge out a living among the ruins . . . and places far stranger. You will find lost treasures . . . and you will find horrors best forgotten. The risks are great, but the rewards are greater. 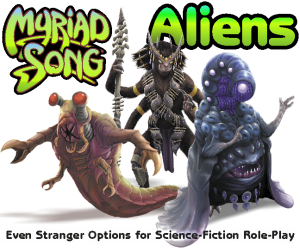 The alien masters of the Syndic ruled over the ten-thousand planets… until they were gone, leaving the Myriad Worlds to their own devices. Only the extremely brave or the terribly foolish would dare explore the mysteries that the Syndics left behind…. Rhys is a soldier, born to follow orders without question. Narli is an aristocrat, who knows no master but herself. 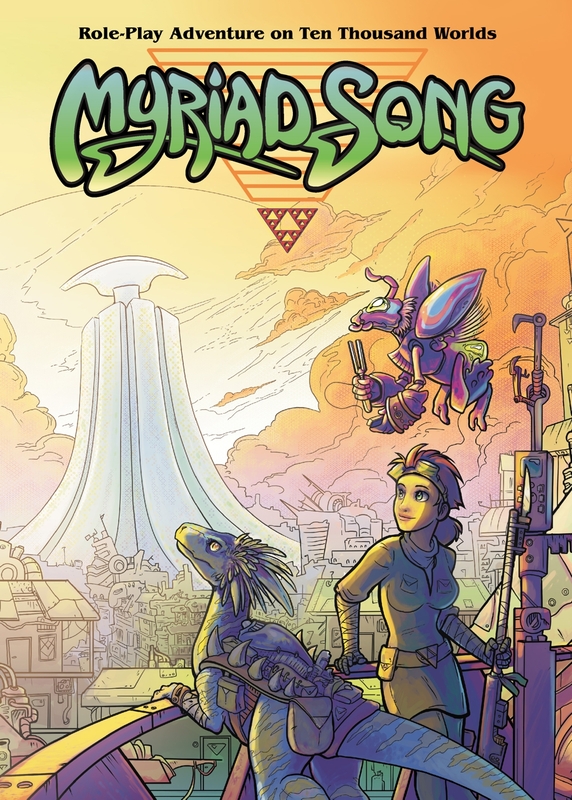 They each have one piece to the puzzle, to find a lost treasure trove of technology abandoned by the Syndic Empire. But when they discover galactic terrorists using that same forbidden technology, someone has to make it their mission to stop them. 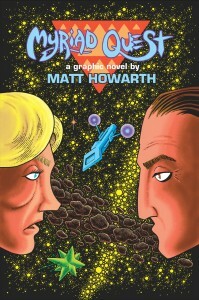 Matt Howarth (Those Annoying Post Brothers, Savage Henry, Teenage Mutant Ninja Turtles, Transmetropolitan) takes you on a strange adventure set in the universe of the Myriad Song: a story of alien drive-bys, suns going nova, a film crew shooting a very peculiar documentary, and a cosmic doom that threatens the entire universe. The early 20th century of the United States was rife with fantastic change: from the rise of industry giants, to the great experiment of Prohibition, to the tragedy of the Great Depression, onto the dawn of the Atomic Age. The sky was tamed, the world was mapped, and the possibilities of science seemed limitless, all blue skies and buttered toast…for some folks, anyway. 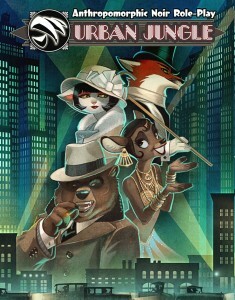 A complete game in one volume, URBAN JUNGLE makes you a player in an anthropomorphic world of pulp-adventure, hard-boiled crime, and film noir. You’ll tangle with hardened gangsters, with jaded debutantes, with world-wear wary veterans, and with all kinds of shady characters. Don’t let the long whiskers and the wagging tails fool you. A smile is just another way of baring teeth. Based upon the acclaimed novels by Wil Radcliffe, NOGGLE STONES: FANTASTIC ADVENTURE AT THE CROSSROADS OF AMERICA puts the players in the roles of either mysterious creatures of myth and legends, or the humble people of turn-of-the-century America, against the threats of darkest myth. When the World of Faerie could no longer contain the forces of evil, a shadow falls over midwestern America … and the dark powers grow stronger in the era New Imperialism, feeding upon fear, greed, and hate. 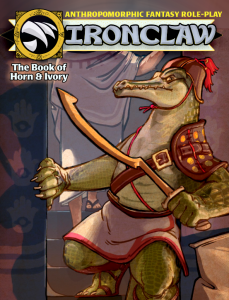 Take up bow and sword, or put your trust in bomb and gun, or take the risks of the supernatural, but remember … your worst enemy lurks in your own shadow.From the designers of IRONCLAW, this book is a complete game in one volume, with rules for making characters both human and supernatural … weapons both from 1900s America and from the Faerie Realm …. a sample adventure to get you started … and more! Fully illustrated, in full color, by George Broderick Jr., with Ernie Colon, and Norman Rafferty. 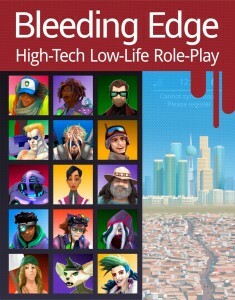 The next generation in role-playing games, BLEEDING EDGE will help you create a character with the limitless potential of next-gen technology, yet weighted down with the legacy of greed, lies, and hate. Explore a future world of supercomputers and subcultures, of multinational corporations and micro-economies, of big ideas and little heroes. Building using Vermillion’s unique system of paired attributes, dice pools, and “take 10” rotes give characters multiple options in many situations. Do you take no risks and just coast on your skill? Or do you push your luck to stack extra dice? Or maybe you let someone else take the lead, while you assist their efforts. Work alone, or work together. Take the point, or lead from the rear. Vermillion rewards you for thinking like your character would, whether you like to plan in advance or to improvise in the field. The game of Bleeding Edge breaks everything down into simple steps so that all players can join in the fun. Work together to deal with your problems, assisting each other along the way…. or split up to cover more ground. Bleeding Edge blends skill and technology together in a way that works quickly and easily. Push your luck for extra rewards, or breeze your way through talent alone. The fantastic world of technology and information is presented to you and your fellow players as tools to help you get stuff done. Experience the future for yourself. Dozens of different sentient races, cultures, and societies are converging upon the strategic island of Calabria. Which side will you take? 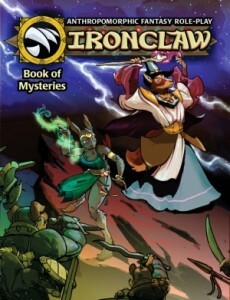 Will you throw your dice with the Bisclavret, becoming a mercenary hoping for riches and glory? Can you stand against the Avoirdupois warriors, in their staggering numbers and unyielding formations? And what of the mysterious Doloreaux, with the rumors that they may have unlocked the secrets of the wizard-kings of yore? Or can you really hope to remain neutral as the fates of nations are decided? 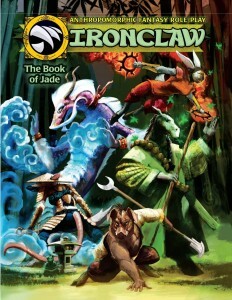 BOOK OF JADE, the 2nd edition, is also available from DriveThruRPG. 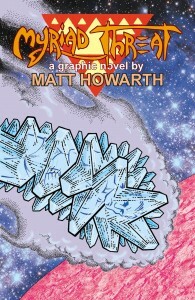 Some of this material has been revised and updated for MAGENTA, available from DriveThruRPG. Usagi Yojimbo RPG is not available at this time.